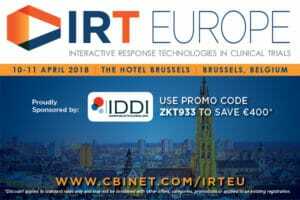 IDDI exhibitor and speaker at CBI’s IRT Interactive Response Technology Europe 2018. New clinical trial regulations are requiring sponsors to keep tighter oversight than ever before – from audit trails to tracking system changes – resulting in high costs and trial delays. IRT Europe explores implementation best practices and how interactive response technologies can be utilized to improve supply chain planning and optimize clinical trials.